This article approaches the performing/interpretative issues arising from the performer’s relationship to models of extended/multi-parametric notation in guitar music. 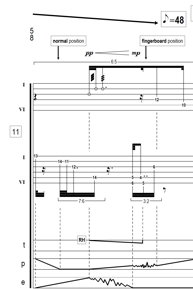 Two works are examined: Aaron Cassidy’s The Pleats of Matter (2005-7) for electric guitar and electronics and Wieland Hoban’s Knokler (2008-16) for solo classical guitar. Both composers have been linked linked to so-called ‘radical complexity’—context in which the figure of Klaus K. Hübler is regarded as crucial in opening the gate for new material domains by means of notational resources (Cox, 2002, p. 75; Mahnkopf 2002, p. 58). Accordingly, I argue that Hübler’s Reisswerck (1987) for solo classical guitar can be regarded as an antecedent in approaching Cassidy and Hoban’s guitar writing in performance. Finally, I discuss the performer’s relation to these models of notation beyond the mere exploration of new playing techniques. Contemporary performance; Parametric polyphony; Multi-parametric notation; Decoupling technique; Physicality. Hübler’s notational model inherently challenges what Cox terms as a High Modernist approach to notation and performance, criticizing its ‘naïve’ tendency toward exactitude and one-to-one correspondence between notation and performance. According to Hübler, when writing for a particular instrument, two aspects are crucial: 1) the imagination of the composer is needed in order to shuttle back and forth between the idea (concept) and the materiality (the instrument and its practice) in a dialectical manner; and 2) the instrument requires a high degree of penetration into the purely physiological aspects of its treatment, to the point that each compositional decision must be conveyed down to the smallest detail; hence, there must be a permanent tension between the instrument and the intention (2002, p. 244). The first aspect can be seen as a reaction to the ‘serialist’ tendency to consider the specific technical possibilities of the instrument as an undesirable obstacle to the realization of the constructive concept (ibid., p. 233) while also naively rejecting traditional techniques and performance styles. The second aspect, moreover, naturally requires extended notational models, such as the use of tablature notation. As an example, see Figure 1 (and video example 1 alongside) - the opening bars of Hübler’s Reisswerck (1987) for solo classical guitar. Consistent with the composer’s statement that ‘one of the most fertile manners of expanding the sound material […] lies in the field of polyphonic production’ (2002, p. 233), this short solo guitar piece displays a two-part writing in which the two sides of the strings (that is, above and behind the stopping fingers of the left hand) are treated as different parameters. Also, some techniques are to be produced through the coordination of both hands (such as harmonics and normal plucked sounds) while others are to be produced exclusively by one hand (e.g. fingertip attacks – using a tapping technique – are performed by the left hand only, whereas pizzicato non-appuyé is to be played by the right hand only). Figure 2 and video example 2 show an evident separation of the action of the two hands: the upper line displays the left-hand fingertip attacks, the bottom line the pizzicato non-appuyé (a right-hand pizzicato with half pressure). According to Barrett, Hübler was probably the first to notate the decoupling idea – which Barrett also terms the ‘disassembly/reassembly’ idea – but it was from the work of some improvisers that Barrett considers this idea to have derived, over a much longer history; to be precise, ‘the work of people like Malcolm Goldstein or Barry Guy or Evan Parker’ (ibid.). For Johnson, among the few composers who rigorously pursue the consequences of Hübler’s approach to string writing, and its applications to other instrumental families, are Aaron Cassidy and Wieland Hoban. As mentioned above, the score displays an extended tablature notation, which indicates precise physical actions of each hand (notated on a separate six-line staff indicating the six strings of the instrument), a tremolo bar (to be played by both hands and the right elbow) and two external pedals (one processing effects, the other a pitch pedal). The notation is entirely prescriptive, focusing upon sound-producing actions (including the sound-modifying actions of tremolo bar and pedals) rather than the sonic results. The main sound-producing actions in this work are plucking, depressing, striking and scraping the strings with both hands; displayed in combination with glissando, bends, trills, tremolos and vibrato (and several sound-modifying actions from the tremolo bar and pedals). All possible combinations of these strata – carefully mapped out – imbue each gesture, each prescribed movement, with a set of musical data defining its musical identity ‘in such a way that the gestural action is itself already a musical object’ (Cassidy in Cassidy & Castro 2015). One of the main actions is the finger percussion attack. The right hand in the two opening bars displays a few versions for this kind of attack in combination with glissandos and trills – see the red rectangle in Fig. 3 (below). Here, the first attack creates an already strong musical identity, and not from guitar playing traditions but from the piano: it is a piano staccato. As discussed with the composer, this gestural type operates exactly like a piano staccato on the physical level – that is, the dynamic direction affects the distance of preparation (the louder the attack, the longer the distance). However, sonically, it notably differs as the open string resonates in the guitar once one lifts the finger after the attack (unlike on a piano), as can be seen/heard in video example 3(a) (below). The blue rectangle in Fig. 3 highlights the left hand and its finger-depressing actions, behind and above the frets – see video example 3(b), below (top-left). The tremolo bar action, in coordination with some finger actions, is within the yellow rectangle. Video example 3(c) (below, top-right) shows the right-arm actions – that is, right-hand and tremolo-bar staves – whose muscular coordination turns more complex after adding the layer of the elbow actions. The localization of the muscle effort in the finger-percussion attacks is more complex in comparison to guitarists’ common muscular reflexes. I propose the shoulder as the origin of the muscle effort (especially in a loud dynamic), whereas shifting places the muscular focus on the elbow, and finger joints are fixed in order to resist the intensity of actions – besides which, the action of the elbow in contact with the tremolo bar with the same arm notably complexifies the muscular coordination. Finally, as an example of reassembly of the above-mentioned parameters and actions, Video example 3(d) (below, bottom) puts them all together, adding the entrance of effects in the second bar (green rectangle in Fig. 3). Figure 4 shows a passage from bars 13–14, in which the right hand displays more gestural types derived from finger percussion such as tremolandos in separate strings (also performed with plucked strings, the last time behind the left hand). The left hand displays some actions of depressing fingers and trills and, most importantly – highlighted in the red rectangle – a case of polyphony on one single string: one finger performs a glissando from fret 11 to 16 while another finger plays three staccato attacks, behind the glissando finger, on fret 10 (see video example 4, above, right). This case of a two-part polyphony on one single string, however, is not the most extreme case. The highlighted passage within the red rectangle in figure 5 shows the most extreme case of polyphony on a single string, in which the actions on the 5th string display a three-part polyphony (i.e. above, behind and between two depressing fingers). However, it remains more a ‘polyphony of actions’ rather than a polyphony of sounds, as the tempi and effects processing distort the sonic results – see video example 5. The highly prescriptive notation of physical motions contrasts the actual sonic indeterminacy, which Cassidy puts forward as ‘a series of gaps – or indeed folds – that separate prescribed actions from their potential sounding results’ (Cassidy in Cassidy & Castro 2015) through electronic processing. In video examples 3, 4 and 5, I used the multieffects pedal, Boss M-8, and therefore, these examples suggest somehow the possible version that may arise from the original performance notes – which reads that effects design is left entirely to the discretion of the performer. The physical/aural distantiation of the electric guitar and the electronic processing involved in my learning process of this work can be seen in the following video examples. Video examples 6(a), (b) and (c) show the same opening bars: figure. 6 (above), bars 1 to 11. Video example 6(a) and 6(b) (below, top-left (a) and top-right (b), recorded in a lesson with Daryl Buckley in Manchester, September 2014) showcase my initial steps on the work in the first (borrowed) instrument I used when learning the work, playing the aforementioned bars, first unplugged (6(a)), and then using the electromagnetic pickup (6(b)). Video example 6(c), in turn, shows a rehearsal with the composer at the University of Huddersfield – two weeks prior to the premiere in February 2015 – using the electronic processing developed by the composer in an MAX/MSP interface. bilder. Omigjen og omigjen. pictures. Again and again. raslingen. Omigjen og omigjen. rattling. Again and again. Knokler is the Norwegian word for 'bones', establishing a bodily connection to the guitar as it resembles the word 'knuckles'. Actually, a main direction employed thoughout the piece in the right hand is that of playing with the flesh of the fingers (instead of the fingernail, as usual in classical guitar technique), forcing the guitarist to bend the joints of the fingers making the knuckles particular visible in such a hand position. As discussed with the composer, the piece does not directly responds to the overall expression of the poem – ‘which is characterized more by morbidity and futility than the visceral or mercurial’ (Hoban, 2016) –although there is a parallel between the placing of small objects to form pictures and the structure of the piece, which is often divided into short units of material that change quite abruptly from one group to the next. A required scordatura, rich in microtones, loosens the strings notably: the 6th string is tuned down to D; the 5th string down to F quarter tone up; the 4th string to A 10 cents up; the 3rd string down to C quarter tone up; the 2nd string down to F♯a quarter toen up; and the 1st string down to B♭. As a consequent of such an unusual low tension in the strings, the physical response of the strings becomes rather fragile. As in Hoban’s other instrumental writing, parametric polyphony is notated on several staves. Figure 7 (below) and video example 7a (below, left) show the first page of the piece and its six staves – two staves for the left hand and four staves for the right hand. The piece employs standard notation (in real pitch) in the first/bottom stave, as in the opening bars 1 to 6. The highlighted passage in Fig. 7, bar 8, displays two parameters in play for the left hand: the bottom stave indicates ‘glissandi’ of the first finger (and the consequent position changes) while the next stave indicates a (rhythmically) independent figuration of the four left-hand fingers (where the four spaces in between lines in the stave means fingers 1 to 4, from bottom up). Video example 7(b) (below, right) shows the specific bar as a case of ‘reassembly’ of each parameter, that is, first playing the bottom stave only, then the second stave and then putting both together. As for the right-hand parameters, figure 8 (below, left) and video example 8 (below, right) show several of them in action. Here, the third stave from the bottom indicates the right hand’s plucking position (determining plucking positions starting from the end of the fingerboard to sound-hole and bridge); the fourth and sixth from the bottom indicate fingers p-i-m-a-e (thumb, index, middle, ring and pinky fingers, respectively); and the fifth stave up shows the strings (1 to 6). Regarding the symbols on the fifth stave in bar 18, the half-circles on top of the note-heads indicate plucking with the fingernail (whereas, in the absence of that symbol, flesh has to be employed throughout). Thus, Hoban’s notational model individuates both physical actions and sonic outcomes (particularly timbre) with high precision. That said, the notated tasks pose challenges that make difficult a ‘one-to-one translation’ of the text (such as the ‘Bartók’ pizzicati and arpeggios in bar 25, in which the notated velocity interferes with the intelligibility of the arpeggios). Therefore, the passages employing notation in six staves make evident not only the parametricisation of the two hands but of each hand. A good example is the last bar of section I – bar 66, seen in figure 9 (below, left), in which the 1st string is subdued to various polyphonic actions of the two hands. That is, in addition to the glissandis and rhythmic figurations of the four fingers in the left hand, the right hand displays the alternance of depressing and plucking actions by the thumb (stave 4) and the index, middle and ring fingers (stave 6), although both hands converge in four harmonics on different strings. See also video example 9 (below, right) for the result in performance. In section II (bars 67 to 130) the tapping technique is introduced. Figure 10 (below, left) offers another example of the parametricisation of the two hands by employing this technique, exemplified in the bar 84 and seen in performance via video example 10 (below, right). A variant of the tapping technique is introduced in section III (bars 131 to 193) by tapping on the sound hole with right hand fingers (see Figure 11, below, bar 175, staves 3, 4 and 5) producing a buzzing sound which interacts with conventional tappings of the left hand. In the same section, these actions converge in descendant gestures made of tappings of both hands, evidencing at the same time a choreographical aspect, as if mimicking a spider traversing the fingerboard. For a performance of the passage, see video example 11 (below, right). Generally speaking, the inner parametricisation of each of the two hands is taken further in sections II and III. As an example, in figure 12 (below-left) (and performed in video example 12, below-right), the first string is subdued to additional techniques such as tapping and Bartòk-pizzicatos played both above and behind (indicated with an arrow) the stopping fingers of the left hand. Even further, bar 159 (seen in figure 13, below-left) adds now the employment of left hand pizzicatos (notated +) alternating fingers 1 and 3 (in conjunction with glissandis) both above and behind (notated with an arrow) the stopping finger, in addition to various of the right hand recourses already in play in the piece. Again, see video example 13 (below-right) for a performance of this section. The works here discussed offer different perspectives of the so-called ‘decoupling technique’, introduced in notation by Karl K. Hübler. My view is that these perspectives offer far more than the mere exploration of new playing techniques (and their consequent sonic outcomes), but a deconstruction of the instrument that forces the performer to engage her practice as a critic of performing conventions. Here, I am particularly reminded of Walter Benjamin’s concept of Baroque allegory in his book on German Baroque drama (Benjamin 1998), in which the concept of allegory is vindicated, not as a failed symbol, but an entirely different power of figuration. For me, the concrete physicality of these models of notation brings out the separation of nature and history in the instrument (3). As Deleuze mentions in the last section of The Fold, in the relation between the concept and its object, ‘allegory uncovers nature and history, according to the order of time. It produces a history from nature and transforms history into nature in a world that no longer has its center’ (Deleuze 1993, p. 125). In conclusion, the decoupling technique in the musical works here discussed emerges not as the rejection of traditional techniques but as the allegorical expression of the conventionality of the historical, reconfigurating new instruments. Included in the CD Shrouded Mirrors released by Huddersfield Contemporary Records, (HCR 10, 2015), and premiered on 26th November 2015 in the CD's launch concert at Huddersfield Contemporary Music Festival. Dedicated to Diego Castro Magas and premiered in St Giles Cathedral, Edinburgh, on 7th October 2016, Alba New Music Festival. For a similar discussion see Castro-Magas, D. (2016) ‘GESTURE, MIMESIS AND IMAGE: ADORNO, BENJAMIN AND THE GUITAR MUSIC OF BRIAN FERNEYHOUGH’, Tempo, 70(278), pp. 16–28. doi: 10.1017/S0040298216000310. Benjamin, W. (1998). The Origin of German Tragic Drama (J. Osborne, Trans.). London: Verso. Cassidy, A. (2007). The Pleats of Matter [musical score; electronic manuscript, supplied by the composer]. ---------- (2012). Gestural modeling and compositional constraints in ‘Being itself a catastrophe, the diagram must not create a catastrophe (or, Third Study for Figures at the Base of a Crucifixion)’. Sonic Ideas (Ideas Sonicas), 4 (1), 1–23. Cassidy, A., & Castro, D. (2015). The Pleats of Matter / The Matter of Pleats. In The Dark Precursor: International Conference on Deleuze and Artistic Research, Ghent. Retrieved from https://www.researchcatalogue.net/view/237688/237689 (last accessed 2 August 2016). Cox, F. (2002). Notes Toward a Performance Practice for Complex Music. In C.-S. Mahnkopf, F. Cox & W. Schurig (Eds. ), Polyphony and Complexity (pp. 70–132). Hofheim: Wolke-Verlag. Deleuze, G. (1993). The Fold: Leibniz and the Baroque (T. Conley, Trans.). Minneapolis: The University of Minnesota Press. Hübler, K. K. (2002). Expanding String Technique. In C.-S. Mahnkopf, F. Cox & W. Schurig (Eds. ), Polyphony and Complexity (pp. 233–244). Hofheim: Wolke-Verlag. Mahnkopf, C.-S. (2002). Complex Music: Attempt at a Definition. In C.-S. Mahnkopf, F. Cox & W. Schurig (Eds. ), Polyphony and Complexity (pp. 54–64). Hofheim: Wolke-Verlag. Rutherford-Johnson, T. (2010). Rambler Roundtables: ELISION Ensemble Concluded [Web log post, 4 February]. Retrieved from https://johnsonsrambler.wordpress.com/tag/klaus-k-hubler/ (last accessed 30 July 2016). Sergeant, M. (2013). the churches of lalibela: erosion and encrustation as transformative musical processes. PhD thesis, University of Huddersfield. Diego Castro Magas is a guitarist specialising in contemporary performance. He has given numerous performances throughout America, Europe and Oceania. In 2015, Diego launched Shrouded Mirrors, a CD of recent British guitar music on Huddersfield Contemporary Records. His research interests are concerned with performing issues in contemporary guitar (both classical and electric), body, gesture and critical theory. Diego obtained his PhD in Contemporary Performance at the University of Huddersfield in 2016, supervised by Philip Thomas. Currently, he teaches Guitar and Chamber Music at Pontificia Universidad Católica de Chile.